If you ask me for my favorite leek recipes, I’ll list things like potato leek soup, potato and leek gratin, leek quiche and leek risotto. In other words, I’ll list a bunch of dishes where the leek is hidden underneath layers of butter, cheese and cream. Now as all of you know, I have absolutely nothing against butter, cheese and cream, but they do have a tendency to hog all the attention for themselves. Leeks have such a wonderful, delicate flavor that it’s a shame there aren’t more recipes to really show it off. This recipe does exactly that: the leek is the center of attention, with a light lemon dressing that highlights its flavor without overpowering it. 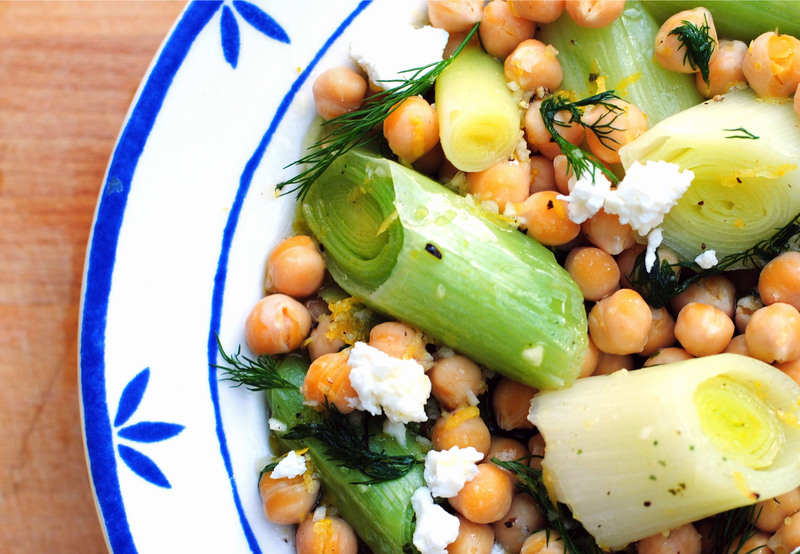 It’s paired with earthy chickpeas, tangy feta cheese and a touch of dill that somehow ties everything together. It’s a remarkably simple side dish that takes about ten minutes to prepare, and proves that leeks don’t always need to be soaked in cream. One quick note about this recipe, because I actually almost didn’t share it here today. The thing is, I wasn’t paying attention and I cut the leeks wayyyy too big for this salad. They tasted delicious (which is why I decided to go ahead and post) but leeks are a hassle to cut because the layers slip around so easily. So when you try this salad at home, boys and girls, don’t make my mistake! Be sure that you chop the leeks into convenient, bite-sized little pieces. I bet the salad will be even prettier that way, too. 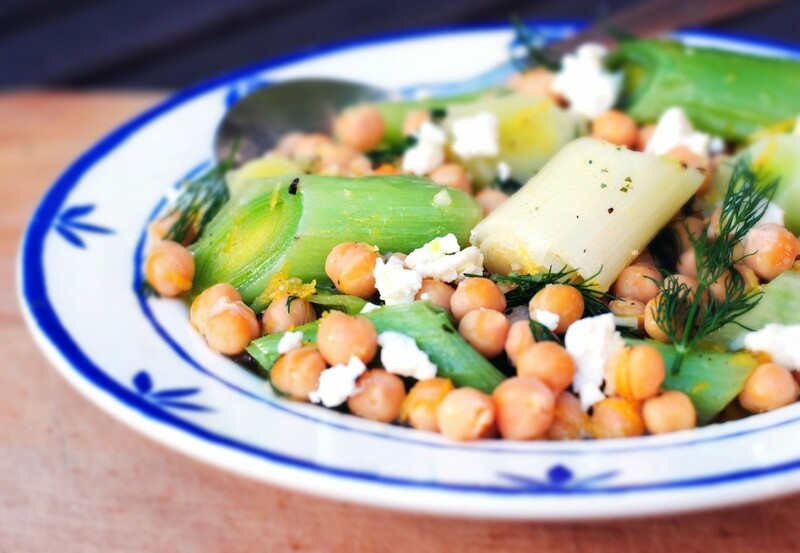 Before you run off and try this recipe, here are some other gorgeous recipes that put leek in the spotlight. Cut off the root ends and dark green tops of the leeks - you'll use only the white and pale green sections. Chop leeks diagonally into 3/4 inch chunks. Place in a bowl of cold water to rinse any dirt from between the layers, but try to keep the layers intact. Make dressing by mixing all ingredients except dill and lemon zest. Set aside. In a large saucepan or frying pan, bring vegetable broth to a simmer. Remove leeks from water and place in the simmering broth, with the flat side down (this will help them cook evenly and stay intact as they cook). Cover and let simmer for 3-4 minutes or until tender. When leeks are fork-tender, remove from the pan with tongs or a slotted spoon and place in a serving dish. Leave the broth in the pan, then add chickpeas and heat to warm through. Toss with about half of the dill. Pour off the excess broth, and place warmed chickpeas on top of the leeks. Pour dressing on top and add remaining dill and lemon zest. Serve warm.